Donna Bolton died Tuesday, June 14, 2016, at her home south of Richland. Donna was born December 27, 1946, in Columbus, Nebraska to LaVerne and Dorothy(Bauman) Thalken. She attended school in Leigh and graduated from Leigh High School. She worked at D&L/Camaco for 40 years. On January 20, 2001, she and Kenneth Bolton were married in Columbus. They lived at "the cabin" south of Richland. Donna enjoyed horseback riding, the Leigh Saddle Club, "junk jaunts", craft shows, gardening and caring for her dogs. She especially loved attending the events of her grandchildren. 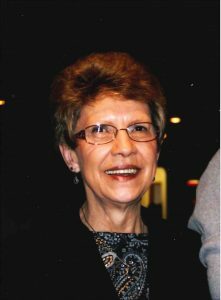 She was a member of St. John's Lutheran Church in Leigh. Donna is survived by her husband, Kenny Bolton of Columbus,two daughters;Renee(Mike) Whiting, Columbus and Tammy Osten of Creston, one son, Kerry Neuhaus of Leigh, 3 step-daughters;Trina(Jim) Benedict, Adams, Trudy Baxa, Trenton, Missouri and Roxann Thompson of Holdredge, two sisters; Rita Thalken of Lincoln and Rose(Roger) Kuester of Creston. Also surviving Donna are 15 grandchildren; Talia(Bobby) Matherne , Ethan Neuhaus, Ben Wemhoff, Jasmine and Tori Osten, Payton Rosendahl, Allison and Taylor Whiting, Samantha Zrust, Jordan, Jeremy, Sydney and Jessica Baxa, Eli and Emree Pilmore, and great-grandchildren Wesson and Kelsie Matherne. She was preceded in death by her parents and a brother, Dean Thalken.